Good News: Kashi's Pizzas Are Single! 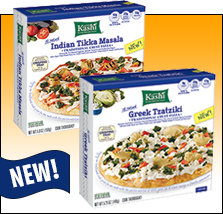 Kashi Single-Serve Pizzas - FINALLY, Kashi has perfectly portioned pizzas!!! And the flavors sound amazing: Greek Tzatziki (with spinach, artichokes, tomatoes, and two cheeses) and Indian Tikka Masala (with eggplant, spinach, and tomatoes). Both vegetarian friendly; both super exciting! Each pizza has 340 - 360 calories, 9g fat, 550 - 640mg sodium, 50 - 53g carbs, 6 - 7g fiber, 4 - 6g sugars, and 17 - 18g protein (PointsPlus® value 9*). At select grocery retailers nationwide. New Flavors! Progresso Light Soups - Great new options from another of our favorite companies! With temperatures falling, we'll be turning to Progresso's Light Chicken & Cheese Enchilada Flavor soup and Light Chicken Corn Chowder Flavored with Real Bacon. Each 1-cup serving has 90 - 100 calories, 2.5 - 4g fat, 660mg sodium, 12 - 18g carbs, 6 - 7g fiber, 2g sugars, and 4g protein (PointsPlus® value 2). We'll raise a spoon to that! GimMe All Natural Roasted Seaweed Snacks in Teriyaki Flavor - We LOVE GimMe's line of crispy seaweed snacks, and this latest flavor is predictably great! A package of the crumbles has 100 calories, 7.5g fat, 140mg sodium, 8g carbs, 3g fiber, 4g sugars, and 2g protein (PointsPlus® value 3*); a serving of the sheets has 25 calories, 2g fat, 30mg sodium, 1g carbs, <1g fiber, 0g sugars, and 1g protein (PointsPlus® value 1*). These are currently available at Sprouts, Fairway, and many independent retailers. You can also buy 'em online at Amazon and the GimMe website! Slawsa Gourmet Topping - This as-seen-on-ABC's-Shark-Tank product is AMAZING. We're obsessed!!! Like a cross between sauerkraut, salsa, and honey mustard, it's sweet, tangy, and all-natural. In Original, Spicy, Garlic, and Spicy Garlic, each tablespoon has just 15 - 20 fat-free calories (PointsPlus® value 0*). It's not available in stores everywhere, but it's definitely worth ordering online. Gentleman Ice Tray - Dress up for your next party in an unexpected way. Who wouldn't want dapper pieces of ice to accessorize their drinks? We're talking bowler hats, mustaches, and more. So cute! Sheila G's Brownie Brittle - No time to make Christmas cookies? Order up a bunch of these sweet 'n crispy snacks! We just tried the latest flavors -- Mint Chocolate Chip and Salted Caramel -- and they're sooooo good. A 1-oz. serving has 120 calories and 4g fat (PointsPlus® value 3*). Click to locate or buy online. Powell & Mahoney Limited Bloody Mary All-Natural Cocktail Mixers - We're pretty picky when it comes to cocktail mixers. Well, these schmancy 'n spicy picks are insanely tasty! In Sriracha and Chipotle, a 2.5-oz. serving has just 20 calories and no fat (PointsPlus® value 1*). Party time! If you like Hungry Girl (which we assume you do, since you're reading this) and you like potatoes (who doesn't? ), mark your calendar! Lisa (HG herself) will be chatting LIVE on Facebook this Wednesday, Dec. 11th, at 3 p.m. ET/noon PT. 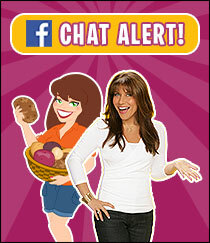 She'll be answering questions about guilt-free eating, holiday entertaining, and more! It all goes down on the Potatoes, Taters and Spuds Facebook page. Click to RSVP! ***In restaurant news, Olive Garden has two new Lighter Italian Fare dishes... but just how light are they? The Garlic Rosemary Chicken comes with mashed potatoes and spinach, all for 510 calories and 19g fat (PointsPlus® value 13*) -- not bad! The Baked Tilapia with Shrimp features a side of steamed broccoli -- this one has 570 calories and 28g fat (PointsPlus® value 13*). A little steep in the fat department for a "lighter" item. To slim it down, request a side of marinara in place of the buttery white-wine sauce. And watch out for those bottomless breadsticks! ***Science time... PepsiCo is reportedly working with a biotech firm to create a "taste modifier" that would allow them to lower the amount of sugar in their soda without affecting the sweetness. The modifying ingredient, we hear, is called S617. Ummm, might wanna change up that name, from a marketing standpoint! How about Super-Awesome Calorie-Reducer 617? ***And if today's gift guide didn't give you enough ideas, we've found the perfect present for the Instagram fanatic in your life. Boomf Magical Mallows can be printed with your favorite Instagram photos on them... Then you (or your pal) can eat those photos. Weird but true! And that's all we've got. HG out! Wanna give your friends some hints as to what you'd like for the holidays? Click "Send to a Friend" to pass along this email right now! December 9th (today) is National Pastry Day. If you haven't made our Cherr-ific Turnovers yet, you totally should!